What surprises would today’s construction industry hold for a time-traveler arriving directly from 20 or 30 years ago? 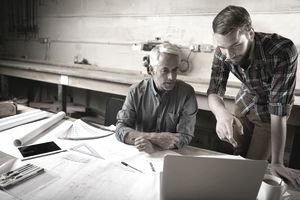 Talk to older generations of building professionals, and you’re likely to find that things we take for granted now would have seemed miraculous a few decades earlier. Much of this can be seen in new technology like construction management software and smart, labor-saving equipment. Yet this technology has also come about because of deeper changes in attitudes to work and in market demand. Those big paper rolls of construction plans are so 1990s! Now can be made using software applications and downloaded into PCs and mobile computing devices like tablets and smartphones. That means they can literally fit in your pocket. Up in a Crane or Down in a Sewer, Talk to Me! How many people had mobile phones 30 years ago? How many people don’t have them today? Besides talk, smartphones offer text messages, email, and collaborative applications to keep construction teams in sync and on schedule. Better than shouting or running around a construction site to find someone. Machines are not new to the building industry, but the changes are in the intelligence that is being built into those machines. For instance, excavators with GPS (global positioning system) capability ‘know’ where they are, and use digital planning information to automatically shape and cut gradients. Project management applications make it easier to keep tabs on different construction phases. They also help to reduce uncertainty and risk in project schedules. And it’s so much more efficient to let the app automatically work things out than to use the pencils, paper, and erasers of the previous century. Construction safety 20 or 30 years ago had already made giant strides compared to the generation before that. Safety rules and regulations continue to evolve. Now online courses let employers and employees schedule training and certification to fit in with building and bringing in revenue. Many customers now rely on the web for their first contact. They want to see who you are, which construction work you specialize in, and what other customers say about you before they let you talk to them. The decades-old tactic of drumming up work by picking up the phone is increasingly outdated. Thirty years ago, Excel was for aliens, and the cloud was what made your building job wet by raining on it. Real contractors battled the math out with calculators and slide rules. Now you can use web-based cost estimating apps in your office, at your customer’s premises or even out on the building site. Today’s buildings are starting to talk. Sensors are being added to constructions to send back information about usage, structural performance, and possible problems. The data is sent over the Internet to data centers that collect it, analyze it and send reports to building management and maintenance teams. The less artificial light and heating (or cooling) required for buildings, the better it is for the planet. Although modern materials and techniques have their place, this is also an area where traditional solutions, ignored for half a century or more, are now making a comeback. In parallel with these developments, another change has happened too. The construction industry has become more accessible to women. New approaches and new skills for project management and construction cost estimation are examples. In another generation’s time, perhaps we’ll write another article like this. If so, the title ‘Not Your Dad’s Construction Job’ might well be edited to add ‘Not Your Mom’s Construction Job’ too!